Joyce has winterized today's Hodgepodge! Click here to write along with us! Ha! This is a good one because I haven't been doing a great job of blogging over the past couple of years. Meeting a fellow blogger over Christmas break helped rekindle blogging for me. I've been to Hilton Head (favorite family vacation spot when we lived in SC), Folly Beach, and Nags Head. But I don't think I've been to HHI in the winter. Weird. I love the beach in the winter. 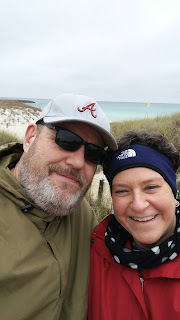 In fact, I just wrote a post about our Winter vacation in Panama City Beach, Fl. (I just realized the title should have been 2017, but...oh well!) Hilton Head can get rather chilly in the winter, and I would imagine Bald Head Island, Nags Head, Folly Beach, and Chincoteague would as well. My recommendation would be to go south...St. Simons might be a little "iffy", so go farther south than that! The beach can be chilly in the winter, but the upside is that you'll have the beach to yourself! I know the lyrics to an awful lot of songs...and I'm not embarrassed to know any of them. I've been known to have the Oklahoma soundtrack blaring from my car, windows rolled down, and the boys begging me to stop! Eating what I want, when I want. Unfortunately, I inherited some bad genes from my mom, so I have to watch what I eat. No quotes, but on New Year's Day, I did the Saint's Name Generator for my Saint of the Year. I randomly received Blessed Titus Brandsma, who isn't a saint yet. He was a Dutch priest who spoke out against the Nazis in WWII and was captured & was a prisoner in several different camps. He ended up in Dachau, where he was tortured, and when he could no longer work because of illness, they used him for "experiments". He was given a lethal injection. I finally got started on my Ireland posts! The first installment is tomorrow, so come back and join me! After reading about Titus Brandsma, the cold weather and inconveniences in life seem pretty minor. That's the good thing about history. There are so many saints (whether officially declared saints or not) who have endured so much for their faith in God. Truly an inspiration. He certainly was an amazing man. I've just started to delve into learning about him. What an inspiration! We really have become such a nation of whiners. We forget how fortunate we are, but whenever I read about heroism in the face of real horror I’m inspired and grateful. I look forward to your Ireland posts. Enjoy your week! I love some of the songs from Oklahoma. I used to listen to stuff like that from my car, but now I'm usually with hubby, so I don't get to listen to it much any more. Looking forward to your Ireland posts. We sing show tunes all the time around here. No one can ever figure out what our favorite genre of music is because we also sing Motown, classic rock, and everything in between. LOL Looking forward to the Ireland posts! HAH! We were singing Oklahoma just yesterday!! I don't even know all the words...or even most of the words...but I still sing Oklahoma at the most random times. Thanks for telling us about Titus Brandsma. I hadn't heard of him. I am pretty much in awe of anyone who went through the Holocaust, whether they survived or not. It's scary what we humans are capable of doing to each other. I just commented and then it disappeared. Please forgive me if this shows up twice! Having the beach all to ourselves -- that's a pleasant thought, but beach walking in the wind with a coat ... not so much! Visiting you from the Hodgepodge today. Blessings! Had to laugh, Oklahoma is a great soundtrack!